Following West End successes including The Gruffalo and The Gruffalo’s Child, Tall Stories return to the London stage once more with their Olivier Award-nominated production Room on the Broom Live. Based on Julia Donaldson and Axel Scheffler’s beloved children’s book, the magical stage adaptation plays a strictly limited festive season at the Lyric Theatre. Join the Witch and her cat as they make a fun-filled journey to defeat a hungry dragon! As they travel around on their broomstick, the pair pick up an unlikely troupe of hitch-hikers, including a very friendly dog, beautiful green bird and crazy little frog. But when they all climb on, the broomstick snaps! After all, it’s not built to fit five! But the dragon has just appeared! Theatregoers of all ages are invited to join the colourful adventure, which is packed full of laughter, scary fun and interactive moments! With songs, jokes and mesmerising puppetry, Room on the Broom Live comes from the award-winning creators Tall Stories, whose productions have entertained young West End audiences for years. 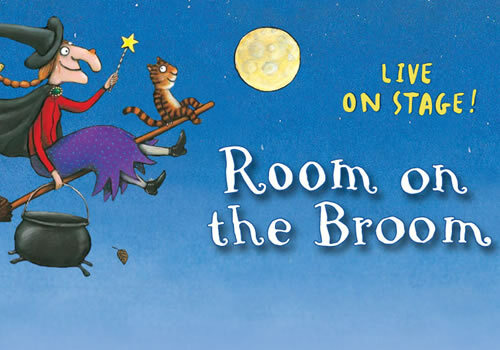 Room on the Broom Live features a cast including Amy Harris as the Witch, Emma Crowley-Bennett as the Dog/Frog, David Garrud as Bird/Dragon and Connor Bloom as an understudy. The production is directed by Olivia Jacobs, and features design by Morgan Large, lighting design by James Whiteside, puppets by Yvonne Stone and music and lyrics by Jon Fiber, Andy Shaw and Robin Price. A thrilling adventure that is guaranteed to enthral audiences of all ages, the brilliant stage adaptation Room on the Broom Live plays a strictly limited season at the Lyric Theatre. Performances run from November 23rd 2018 to January 13th 2019. Room on the Broom Live is suitable for those aged 3 and up. Children under 18 months and babes in arms may attend for free but they must be on a lap and not on a seat. Please request a 'babes in arms' tickets at the theatre box office upon arrival.